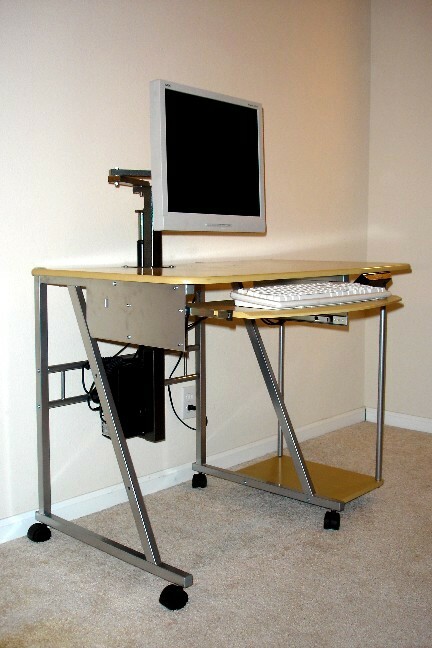 Order the Infinity Station ll Sit/Stand Workstation with FPA arm: $1,999.95; 30"d x 48"w. Please call for quantity pricing. 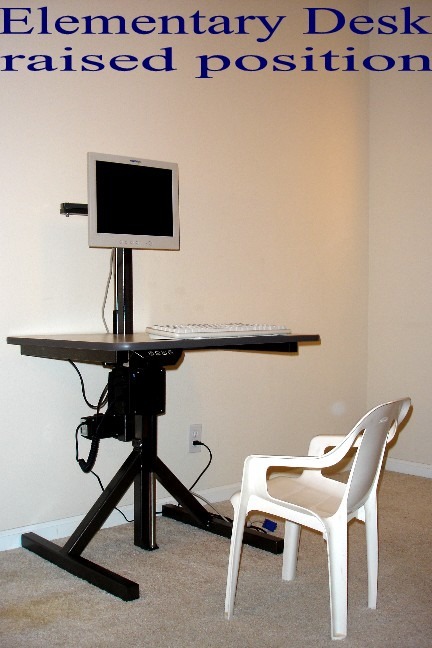 This workstation is primarily for short persons, regardless of age. 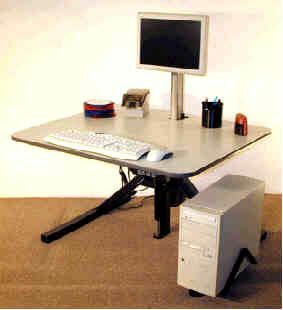 Please call for quantity pricing, get the PTA together and ask the school-board for children's ergonomic and ADA compliant workstations. Options: please see the options available under the Infinity Station ll, above. The Infinity Station with 14" of height adjustment for the main work surface, 21-35" and the monitor lift has 14" of height adjustment for a thin, flat panel monitor, a versatile, swiveling, tilting arm for TFT and LCD thin, flat panel monitors (75mm (3" ) or 100mm (4") VESA mounting system; please specify), from 1-15" above the work surface. 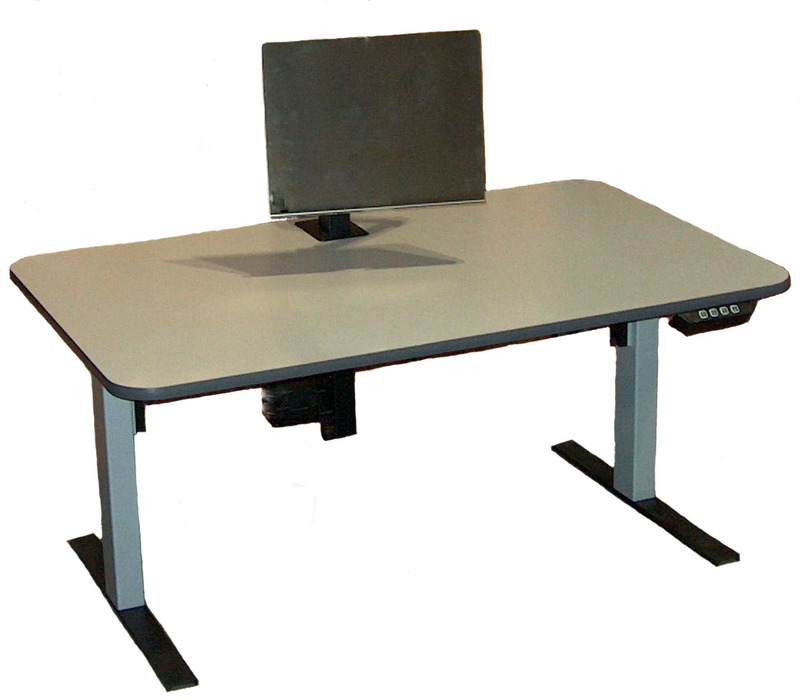 The Infinity Station with dual electric drives is the only adjustable workstation with a powered monitor lift that can raise the monitor with and above the main work surface, to the ergonomically recommended eye level position. The Infinity Station has a total capacity of 400#, including up to 25# of thin, flat panel monitor or 100# of CRT monitor. 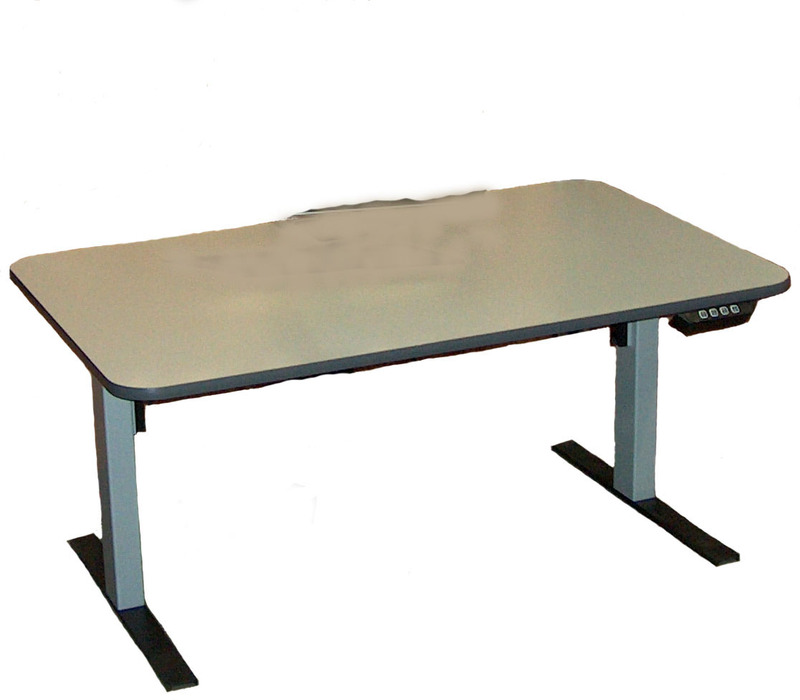 Check to see if your thin flat panel monitor is VESA compliant at: http://www.ergoindemand.com/flatscreen3.htm Top Color: light gray with charcoal gray PVC T-molding. 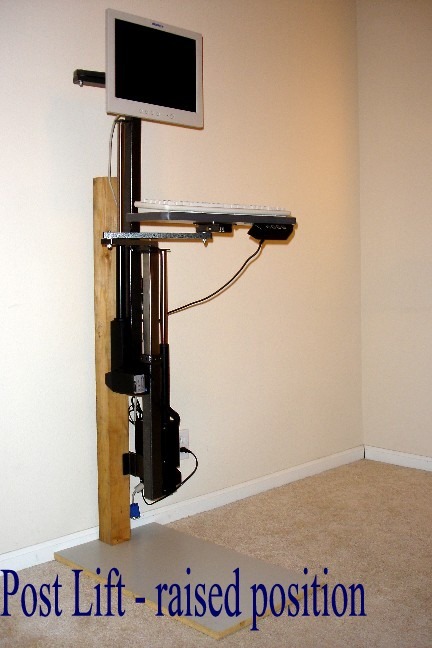 Post Lift with 14" range of lift; PLFP with Flat Panel Monitor Lift or Wall mount with Flat Panel Arm WLFP:$1,299.95 Pedestal Mount Lift with Flat Panel Arm PMFP $ price varies by design and options. Our Post Lift mounted on a 4" x 4" wood post for demonstration purposes. The first post lift with a large combined range of powered keyboard and monitor height adjustments. Please let us know if you are mounting this to a flat faced or round post or if it is to be wall mounted. 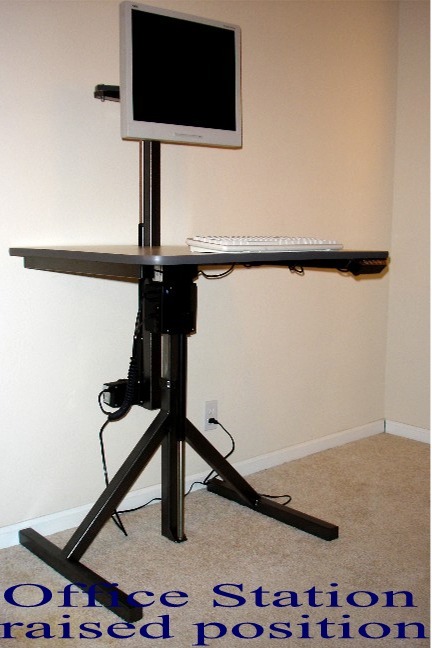 The post lift has the same extensible style of arms on the keyboard as the flat panel monitor arm. 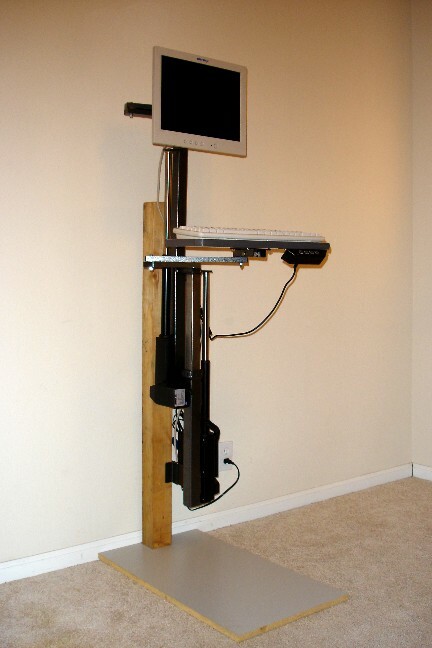 The keyboard and monitor can be viewed and used from any side of the mounting post. Please specify 75mm or 100mm VESA mount. 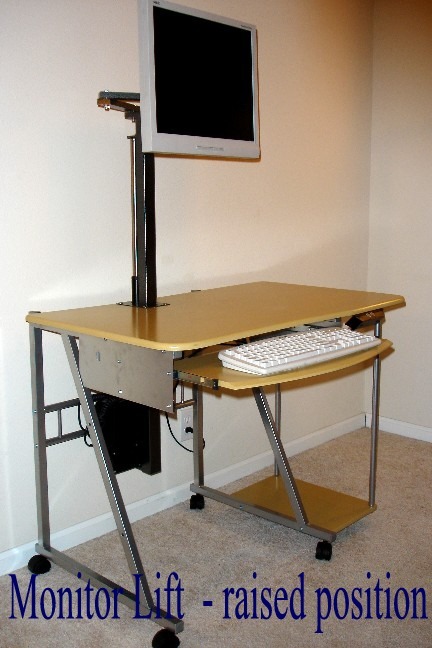 Monitor Lift with 14" range of movement; CRTML (Cathode Ray Tube Monitor Lift) $699.95 and FPML (Flat Panel Monitor Lift) $399.95 In the picture at left our monitor lift has been attached to an inexpensive table. 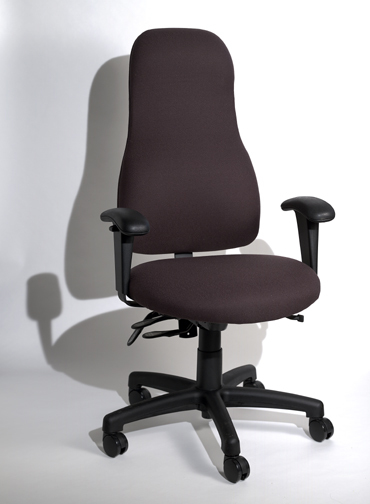 Work support, 24" x 24", with 500# lift capacity for use in manufacturing, assembly, etc., 14" range of height adjustment. 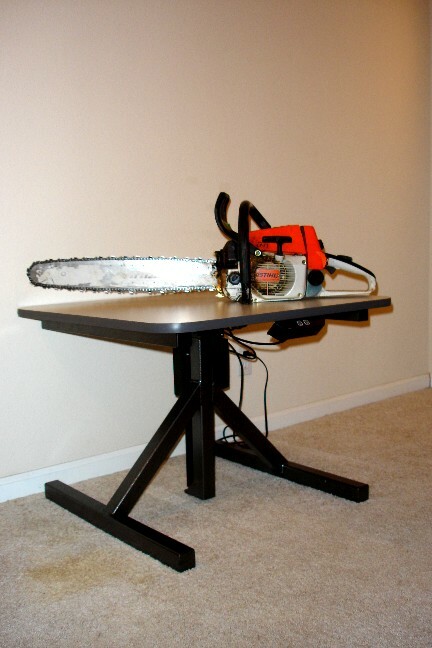 Customized tables, sizes and lift ranges from 22"-36" and up are available, please call for a quote. The base size increases as the height and/or range increases. 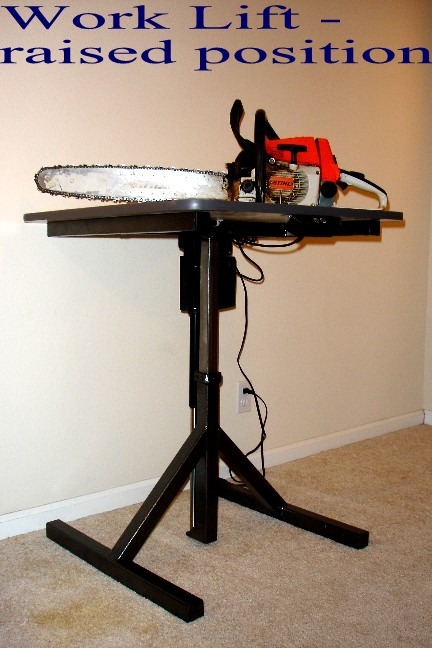 With casters WLSC, $59.95 adds 2" to the top and the bottom of the lift height range the standard model range is 24"-38". Prices and specifications are subject to change. Please call for quantity pricing.